I’ve been writing about restaurants for about 2 ½ years now. The difference between myself and a critic is that I don’t have anyone paying for my meals. Everything you’ve read about has been on my own dime. J and I really just like to eat out and try new places. I don’t do this because I’m getting a whole bunch of free food. I do it because I like to write and I like to eat. I don’t go looking to be a part of the media so I don’t usually get invited to grand openings, ribbon cuttings, or private pre-opening parties. About a year and a half ago, I found Twitter. The service was still pretty young at that time and there weren’t a whole lot of people using it, but instantly, I started connecting with people who found it easier to talk to me through Twitter than by comments or e-mail. There are several people I know here in Kalamazoo only as their Twitter handle. I’ve never met them. Haven’t even seen a picture of most of them, but still, I feel like I know them just through conversations and posts on the social network. A few weeks ago, I got an e-mail from the new Smashburger franchise asking for contact information. They were inviting some of the social media folks to a special preview of the new Kalamazoo store. I was a little hesitant at first only because I’m not a very social person. I’ve never tried to hard to actually hide my identity, but there are very few people who actually know who I am. Still, I mentioned it to J and she was really excited about it, so I e-mailed back and put my name on the list for this special preview. 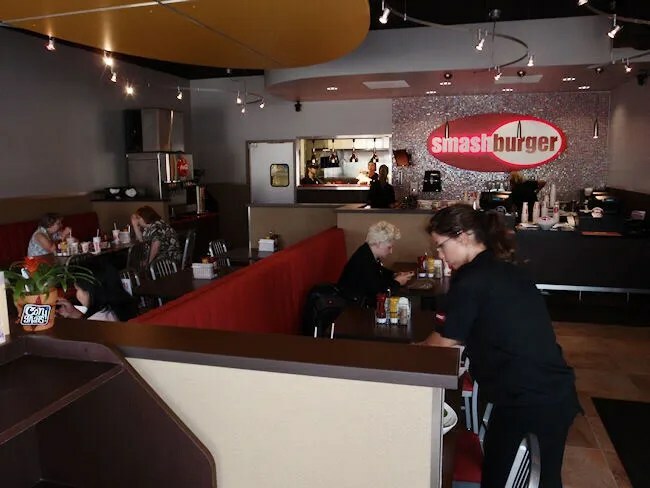 Smashburger is a chain of hamburger joints based out of Denver. The chain is in the middle of an expansion and Kalamazoo is the only location right now in the state of Michigan. When they initially announced the franchise back in the spring, there were plans for five locations in the Kalamazoo market. I forgot to ask if that was still in the plans. The people that own this franchise are the same people that have brought Firebowl Cafe and The Wine Loft to Kalamazoo. 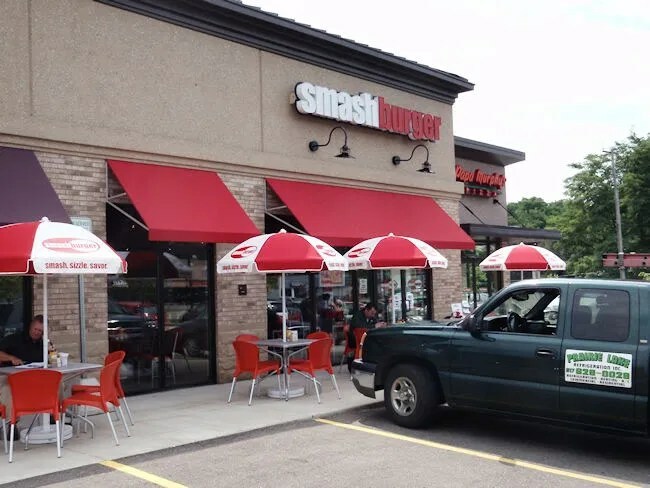 The first Smashburger location is on West Main Street a coupe blocks east of Drake Road. The building is in a little strip mall right next to the Hangar Bar & Grill. Once inside, we made our way to the small order counter near the back. The set up is a pretty standard quick service design. There is an order counter along the back wall which has an opening into the kitchen. The remaining space is the dining room with a number of seating options. We’ve both heard good things about Smashburger from friends who live in an area where the chain is already established, but neither of us have eaten at one before. There was no menu on the wall anywhere, but there are menus on the counter and paper menus scattered in various locations between the door and the order area. In the interest of full disclosure, I have to mention here that are meals were free. We didn’t know that going in and J had actually pulled out a credit card to pay, but she was told it wasn’t necessary. Even with that little perk, my review of Smashburger wouldn’t have been any different. It was pretty obvious what I wanted to try, but the problem came with deciding exactly which burger I wanted. They have six options which come with either a certified angus beef patty or chicken breast that can be either grilled or crispy. I skipped all those options and went with the “Create-Your-Own” option. Burgers come in the ¼, 1/3, and ½ lb. options. I went with the 1/3 lb. 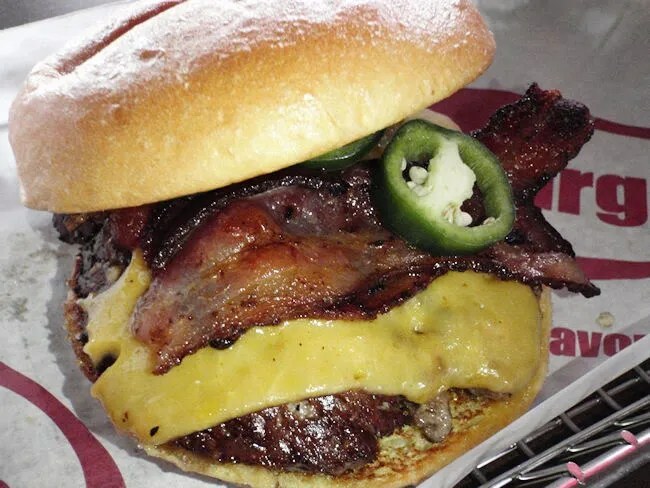 The other options I went with were the classic egg bun, sharp cheddar cheese, jalapenos, and applewood smoked bacon. 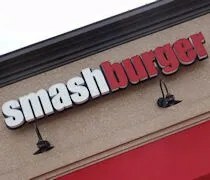 Smashburger gets it’s name from the way they prepare the burgers. Instead of throwing a patty on the cook top, they put a ball of fresh meat on the grill and smash it down with the back of a spatula. By doing it this way, you know you’re always getting fresh meat because there’s no way you could do this with a froze hunk of meat. 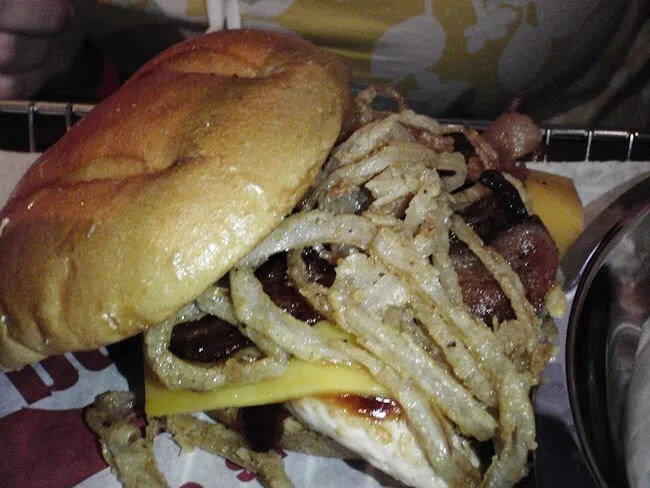 The thing that really makes Smashburger stand out from the competitors is the bun. I went with the classic egg which is kind of a dense yet silky bun that really holds up well to all the juices that spill out of the meat when you take a bite. The whole package was delicious. The jalapenos were fresh jalapenos and not the pickled variety and the cheese was melted into the meat. I really wish I had gone for the bigger ½ lb because it was so delicious that I was left wanting more. J decided to go with one of the Smashchicken sandwiches. She got the Cherry BBQ, Bacon, & Cheese Smashchicken which has a Michigan twist to it. The chicken J got was grilled and on a classic egg bun. It’s topped with a Michgian Cherry BBQ sauce, applewood smoked bacon, haystack onions, and cheddar cheese. She said the sandwich was very tasty and she loved the cherry BBQ sauce. It’s very cool that Smashburger is using some local ingredients like the cherries to make this Smashburger a little different that the others in the chain. As for sides, we kind of got a smorgasbord. When we ordered, we only ordered two. I got the Smashfries. 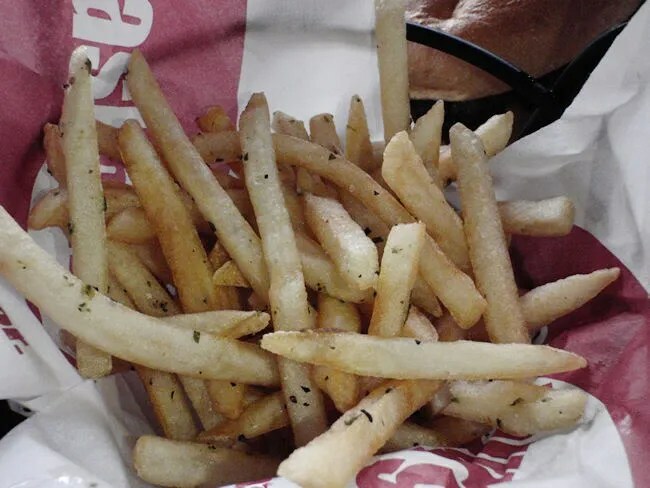 They are fresh cut fries tossed with rosemary, olive oil, and garlic. J had a couple and called them some of the best she’s ever had. I thought they were delicious and loved the seasoning. J ordered the Veggie Frites. When I first started looking at the menu, I knew that was something she was going to like. 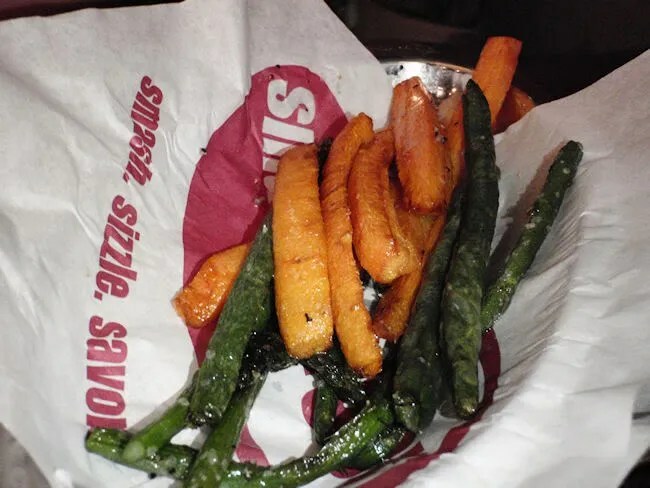 They take asparagus spears, carrot sticks, and green beans then flash fry and salt them. She was a big fan. 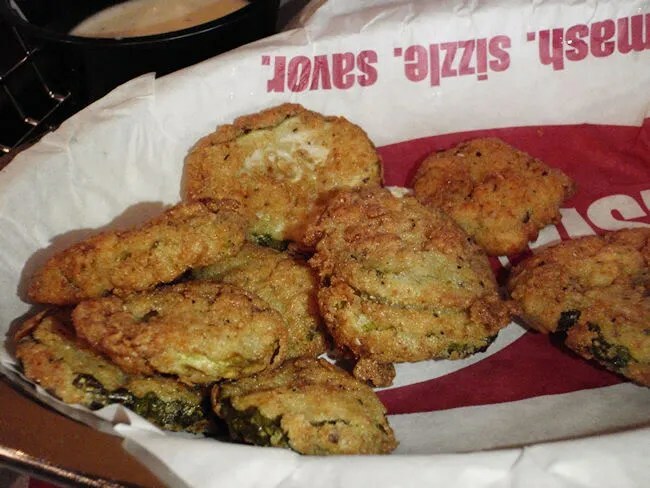 Most times when veggies are deep fried, they’re battered. These are not. They’re tossed into the fryer raw and cooked quickly. We were sitting with some other local Tweeps and there was kind of a community table type thing going on. Even though we didn’t actually order them, we ended up with all of the Smashsides on our table so we could all get a taste. They brought out Michigan Harvest Salad which J loved. It was exactly the kind of salad she likes with marinated balsamic tomatoes, Michigan cherries, blue cheese, and a balsamic vinaigrette. She told me if I’m ever in the mood for a burger and she wanted a salad, we now have a place to go. There was also a basket of Haystack Onions, Sweet Potato Smashfries, and Fried Pickles brought out. I don’t like onions, so I passed on those, but they got rave reviews from the table. Same with the Sweet Potato Smashfries. They seemed to be the most popular item. J said the sea salt really countered the sweet so they were perfect. 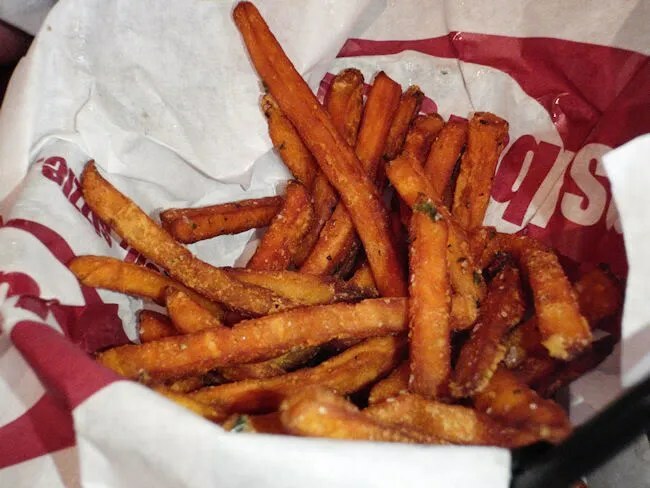 Too often, sweet potato fries are too sweet. Not these. I thought the pickles were really good, but most of the others thought they were a little too salty. There was kind of a heavy salty aftertaste. It didn’t bother me, but it did others a little. Both a local rep and a corporate rep where walking around talking to people as we were all taking pictures and posting them to Twitter. That was the purpose of inviting us. It was great advertising for them because all of our followers were getting a look at what Smashburger has to offer. Just between J and myself, we have over 500. A couple of the other attendees have just as many followers if not more. Smashburger has been all over social media for several months now creating hype and this was an interesting way to create some hype the day before the big grand opening. Had we paid for our meal, it would have been about $23. We both left stuffed and very impressed with the offerings. The burgers were delicious. More and more restauranteurs are starting to realize the boring frozen patty that we all grew up on isn’t going to cut it anymore. If you want to survive in a crowded market, you’re going to have to offer something different. Smashburger does that. Not only do they bring juicy, delicious burgers to the table, but they come out swinging with their sides. Those are great lookin’ burgers. What are Haystack Onions? You mention Michigan Cherries, but are they actually locally grown? Even the Traverse City Cherry Festival often needs to import Cherries from out of state if they didn’t ripen in time for the festival. Haystack Onions are thinly sliced onions battered and deep fried…..the picture of the chicken sandwich above shows them pretty well…they’re on that sandwich. I have no reason to believe they’re not local. This store in Michigan is the only one that has the Cherry items on their menu. Don’t know if I will be back to Smash Burger. Burger’s were good but not “the best I’ve ever had!! !” In my opinion Five Guys and their Kalamazoo Clone “The Real Deal” are much better. The sides were the highlight to the meal although I thought the salt was little heavy for my taste and I like salt. The worst part was that we were asked 10+ times if we would like our table cleared. The owner, in fact, walked up and cleared our table and uneaten food without even asking. We weren’t done yet. Bummer. I don’t think I said “the best I ever had.” but they are very tasty I will agree…I’m still a huge fan of Five Guys and very jealous East Lansing is getting one…. Went to try the place out. Not impressed. Head to Culver’s, and save a few dollars.